East Timor Law and Justice Bulletin: FRETILIN re-states its commitment to 2010-2020 as "The decade of peace, stability and development"
FRETILIN re-states its commitment to 2010-2020 as "The decade of peace, stability and development"
FRETILIN MEDIA RELEASE Dili, 21 May 2010 - FRETILIN re-states its commitment to 2010-2020 as "The decade of peace, stability and development"
FRETILIN party Secretary General Mari Alkatiri yesterday reaffirmed his party's long held and continuing commitment to tirelessly contributing to making the coming decade one of "peace, stability and development" for the people of Timor-Leste. Dr. Alkatiri was speaking to a large gathering of thousands of FRETILIN members and invited guests, including President Jose Ramos Horta, FRETILIN President Francisco Guterres Lu Olo, veterans of the resistance, ambassadors and representatives of other national political parties, at FRETILIN headquarters to celebrate the 36th Anniversary of ASDT/FRETILIN's foundation. "We as a people, as a nation need peace and stability if we are to attain the human development that will bring social and economic development to our people. We pursue this peace and stability remembering very soberly and without illusions that in 2006 our nation traversed a crisis that took us to the brink of civil war. The 2006 crisis happened not because there was only one thing wrong, not just because FRETILIN did wrong, but because many things had gone wrong, and we must recognize that many of us did things that were wrong. As the Prime Minister at the time I accepted responsibility as head of government, resigned to avoid further bloodshed and faced my accusers in a criminal investigation. I was vindicated in that I was found innocent of any criminal wrongdoing. I have publicly acknowledged many times since 2006 that I accept responsibility for my government and party's failings that contributed to the 2006 crisis. However, it is a lie to say that I was the only one to blame for the crisis. "When we accept the mantle of national leadership one must be ready to assume responsibility, especially when one is the leader of the government. We cannot simply blame others around us and continue to assert that it is everyone else who has failed or made mistakes, and that we never make mistakes. We are all in this nation building exercise together, as one. There is not one person or party who alone can guarantee peace, stability and development for our people and nation. It will take all of us working together to attain these things. In post-conflict societies such as ours, we have to strive to ensure nobody feels excluded from the governing process. It becomes necessary to build platforms of consensus on truly national development policy. No one should exploit the emotions of our people for political expediency. Everyone should know how to be objective and specific in the messages they deliver to our people in our political contests," Alkatiri stressed. President Jose Ramos Horta also addressed the gathering, delivering the same message he delivered the night before to a gathering of national and international dignitaries at the presidential palace, in acknowledging FRETILIN's contribution to moving on from the 2006 crisis to achieve peace and stability. "I would like to take this opportunity to especially acknowledge the positive and constructive role played by the FRETILIN party in creating the enabling environment for peace and stability in this country. The political maturity and critical posture showed by its leaders and cadres has contributed immensely to consolidating and sustaining the precious peace that we are now enjoying after the 2006 crisis," the President told assembled national and international dignitaries at a cocktail party following an honors award ceremony at the presidential palace on 19 May 2010. 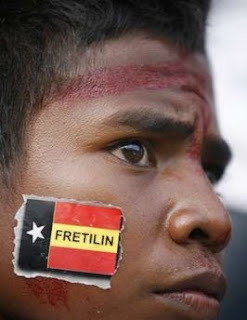 FRETILIN party president Lu Olo stressed that despite being persecuted and victims of organized political violence in 2006 and 2007, FRETILIN maintained its dignity and belief that ordinary people wanted peace, stability and development and FRETILIN had to keep this desire by the people alive, despite being unconstitutionally pushed into opposition. President Horta, FRETILIN president Lu Olo and Dr. Alkatiri also presented former veterans of the national liberation struggle with certificates of recognition for their involvement in FRETILIN, the party that began and carried through to its conclusion the fight for national independence. For further information contact Jose Teixeira MP on +670 728 7080.